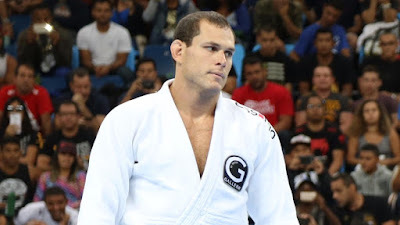 Following Roger Gracie's epic win over Buchecha (and subsequent retirement from jiu-jitsu competition), there is now a vacant spot in the IBJJF Heavyweight Grand Prix lineup for August 26 in Las Vegas. An experienced veteran known for his dynamic and unorthodox game, Cyborg is a fan favorite and a natural choice to shake things up int he GP. Plus, who wouldn't want to see a rematch with Mahamed Aly after their insane battle at Worlds? He just made his return to the gi last weekend, winning double gold in San Jose. He's been training in the gi for his superfight with Travis Stevens, so Simoes should be in good shape for the Grand Prix. Roger was the guy repping Gracie Barra among the eight athletes, and his exit has opened up a spot for somebody else from the team. Pena's creds as a high-level competitor put him top of the list to carry the GB flag into battle. Xande was the Ribeiro rep last year, so letting Lovato Jr. take a stab at the GP this year seems only fair. Lovato is currently signed up for the Masters Worlds that same weekend, so the short notice call-up shouldn't be a problem for him. This is a long shot, but why not call up the Olympic judo silver medalist, a Renzo Gracie team black belt? He's an animal on the mat whether standing or on the ground, and his name guarantees a lot of extra attention on this already prestigious tournament.